2.25 oz of Peppered Beef Jerky It stands out for its rich meaty flavor, alluring smokiness, and subtle sweetness – all accented by a thoughtful dash of pepper. It stands out for its rich meaty flavor, alluring smokiness, and subtle sweetness – all accented by a thoughtful dash of pepper. 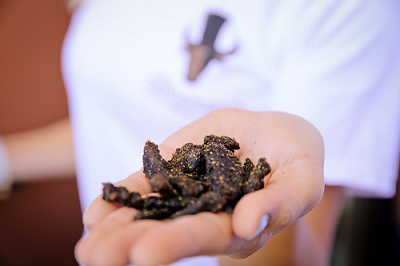 Rugged "french-fry cut" shards make for easier snacking (gnawing on big slabs of dried meat? Barbaric!). High-grade beef seasoned with only the most refined organic herbs and spices create just-bold-enough flavor and an aroma any gent would be proud to have on his breath. You'll want to eat the whole bag. 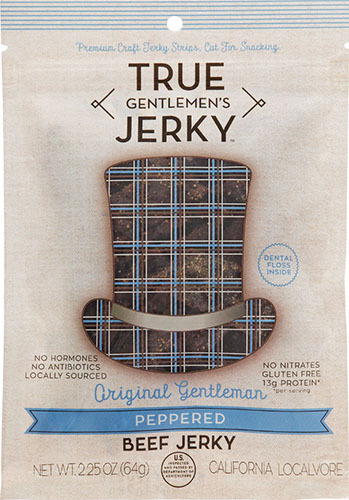 After all, a gentleman needs fuel just like any other, and this is a lean protein jackpot – so spare your modesty.